Rear spring installation set for mono-leaf springs. 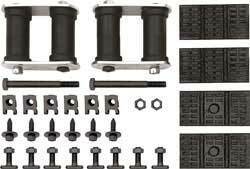 Sets come complete with rear shackles, upper and lower spring pads, spring eye bolts, clips and screws for mounting. The 1967-70 shackle sets include the correct plates, bushings, bolts and nuts for authenticity. Note: U-Bolts are not included in this set.